In the previous post, you learned about RFID and keypad based door lock system in which you had to first scan the right tag and then enter the correct password to open the door lock. Now we are going to add the Sim900 module in that system to make it an RFID and Keypad based Door lock and alert system using Arduino. On scanning the wrong tag or on entering the wrong password, it will send us an alert. On scanning the right tag and on entering the right password, it will send us a confirmation message that the door has opened. You can halt the system by sending ‘close’ message to Arduino and it will only go back to normal mode when you will send the ‘open’ message to Arduino. During halt time, it won’t scan any tags and it will only look for messages. You can also open the door by sending message to Arduino. The RFID reader communicates with the Arduino through the SPI protocol and different Arduino boards have different SPI pins. The I2C LCD communicates with the Arduino through the I2C protocol. Different Arduino boards have different I2C pins. The I2C pins on Arduino Uno and Arduino Nano are A4, A5. 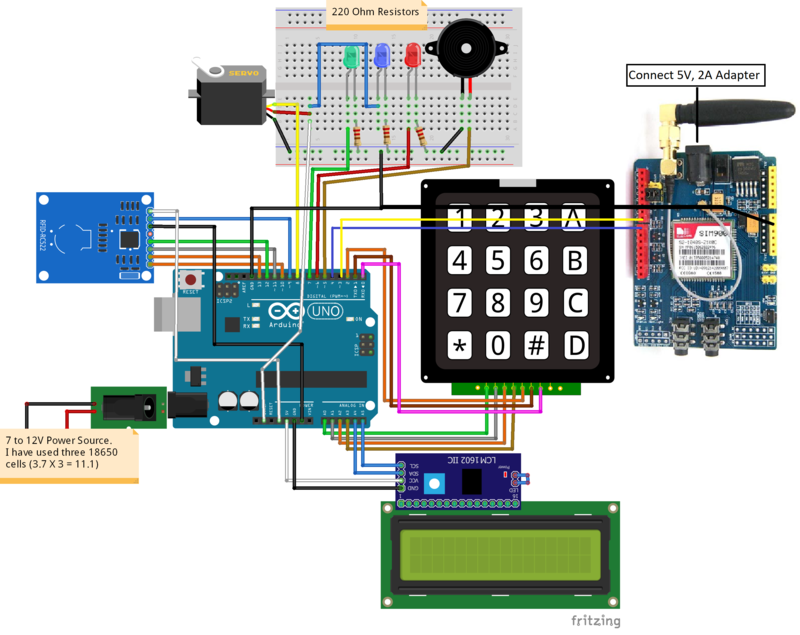 Next connect the keypad with Arduino. The 4X4 keypad has 8 connections but we don’t require the last column of keypad. We only require numbers for the password. So we won’t use the last pin of keypad which is for fourth column. You can also use 4X3 keypad instead of 4X4 keypad. For powering the SIM900 module, the recommended power to use is 5V, 2A but I have used the 5V, 1.5A power adapter and it worked fine. Once you have powered the SIM900 module, the power light will light up and on pressing the power key, the status led should light up and the netlight should start blinking. At this point, make a call from your mobile to the sim you have placed in the SIM900 module. If you are successful in making the call, then your sim is working properly with the SIM900 module. In the end, connect the power source to the Arduino. I have used three 18650 cells. We can give 6 to 12V to the Arduino through the barrel jack. The initial password is ‘1234’. // If UID of tag is matched. // If UID of tag is not matched. incomingData = SIM900.readString(); // Get the incoming data. Hire me at www.freelancer.pk/u/Muhammadaqibdutt. Use my referral link (www.freelancer.pk/get/Muhammadaqibdutt?f=give) and get $20.